(Nanowerk News) Scientists have discovered a way of mimicking the stunningly bright and beautiful colours found on the wings of tropical butterflies. The findings could have important applications in the security printing industry, helping to make bank notes and credit cards harder to forge. The striking iridescent colours displayed on beetles, butterflies and other insects have long fascinated both physicists and biologists, but mimicking nature's most colourful, eye-catching surfaces has proved elusive. This is partly because rather than relying on pigments, these colours are produced by light bouncing off microscopic structures on the insects' wings. The bright green wings of the P. blumei butterfly result from the mixing of the different colors of light that are reflected from different regions of the scales found on the wings of these butterflies. 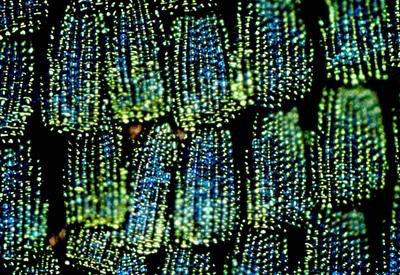 Mathias Kolle, working with Professor Ullrich Steiner and Professor Jeremy Baumberg of the University of Cambridge, studied the Indonesian Peacock or Swallowtail butterfly (Papilio blumei), whose wing scales are composed of intricate, microscopic structures that resemble the inside of an egg carton. Because of their shape and the fact that they are made up of alternate layers of cuticle and air, these structures produce intense colours. Using a combination of nanofabrication procedures – including self-assembly and atomic layer deposition – Kolle and his colleagues made structurally identical copies of the butterfly scales, and these copies produced the same vivid colours as the butterflies' wings. According to Kolle: "We have unlocked one of nature's secrets and combined this knowledge with state-of-the-art nanofabrication to mimic the intricate optical designs found in nature." "Although nature is better at self-assembly than we are, we have the advantage that we can use a wider variety of artificial, custom-made materials to optimise our optical structures." As well as helping scientists gain a deeper understanding of the physics behind these butterflies' colours, being able to mimic them has promising applications in security printing. "These artificial structures could be used to encrypt information in optical signatures on banknotes or other valuable items to protect them against forgery. We still need to refine our system but in future we could see structures based on butterflies wings shining from a £10 note or even our passports," he says. Intriguingly, the butterfly may also be using its colours to encrypt itself – appearing one colour to potential mates but another colour to predators. 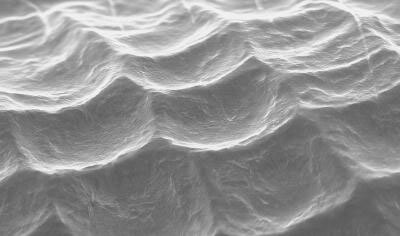 This scanning electron micrograph shows that the surface of a wing scale is covered with concavities. Kolle explains: "The shiny green patches on this tropical butterfly's wing scales are a stunning example of nature's ingenuity in optical design. Seen with the right optical equipment these patches appear bright blue, but with the naked eye they appear green. "This could explain why the butterfly has evolved this way of producing colour. If its eyes see fellow butterflies as bright blue, while predators only see green patches in a green tropical environment, then it can hide from predators at the same time as remaining visible to members of its own species." The results are published today in Nature Nanotechnology.